On Sunday, May 4, Holy Eucharist Parish celebrated a very important occasion in the life of the Parish and in the lives of some of our youngest parishioners. 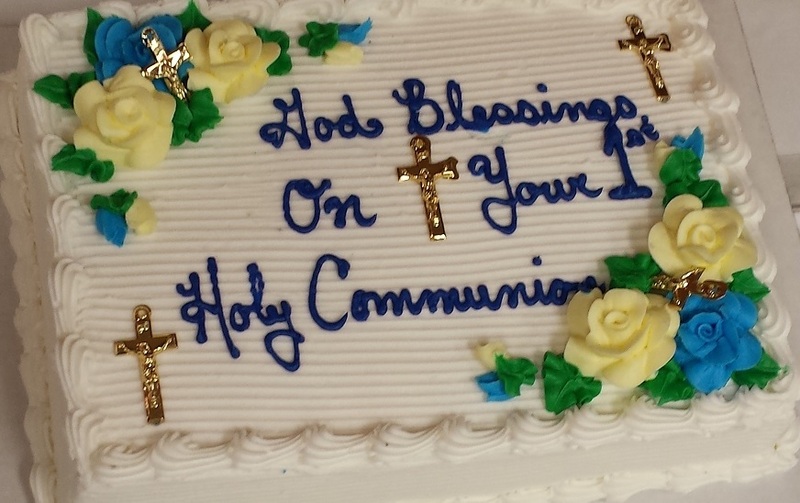 Children who had prepared for a whole year of Level 2 Catechism under the direction of Mrs. Joan Buchel, received Holy Communion with their family and friends and all parishioners at the Divine Liturgy which included many special moments, prayers and symbols designed for the day. 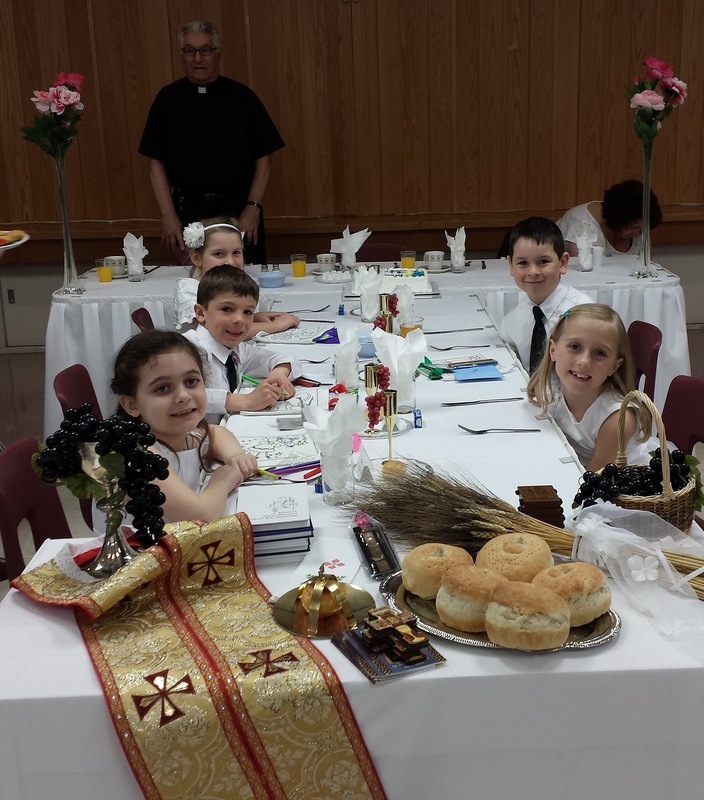 On Saturday afternoon, the children helped Mrs. Margaret Chemerika prepare the ‘Prosphora’ communion bread. They each prepared a loaf that would be used for them and their families the following day at the Eucharistic Liturgy. After preparing the Prosphora, they made their way up into the church where they were met by Parish Priest, Fr. Michael. He asked them questions about the great mysteries (Sacraments) in which they were about to participate – Confession (Holy ‘Penance’ or ‘Reconciliation’) and Holy Communion (the ‘Holy Eucharist’). They answered boldly and brilliantly! They had learned their Catechism well. Then they concentrated on the Sacrament of Confession after which they each approached the Lord (through His priestly minister) and made their first Confession. These children were beginning a new life of personal commitment to the Lord by which they were taking upon themselves the responsibility of receiving the Sacrament of Penance according to their conscience in the months and years ahead. They were also accepting the responsibility to prepare themselves well – through prayer and Confession when necessary – to worthily receive our Lord in Holy Communion. The next day, Sunday morning, the children processed into the church – each accompanied by his/her family. They each brought forward a different gift and a flower to place in a vase prepared for this purpose. Then each read a quote about the mystery of Holy Eucharist. Profound statements! in which they will grow in understanding throughout their lives – as we all do. Fr. Michael preached the homily at this special Liturgy at which Fr. Edward and Deacon Myroslaw also concelebrated. During the homily, the children and their families and the whole parish were asked to understand that this was a marvelous new beginning in the life of each child and if everyone supported them and encouraged them – then their potential as followers of Christ was limitless. The ladies of the parish under the direction of the President of the parish branch of the Ukrainian Catholic Women’s League, Mrs. Joan Lewandosky, prepared a special reception for the children, their families and guests and all the parishioners in the auditorium. Parish organizations presented each child with gifts and mementos of the occasion. Cathy Evanyshyn, Chair of Parish Council, representing the parish… Mr. Ron Aftanas, President of the Ukrainian Catholic Brotherhood, Bro. Ed Swiecicki, Representing the Knights of Columbus and Mrs. Joan Lewandosky, President of the UCWLC. God bless and watch over these wonderful children who have given themselves to You.